This exciting event takes place in the SLOWstudio where seven London textiles designers work daily to create exquisite textiles – knit, stitch and print – for retailers, galleries and private clients. 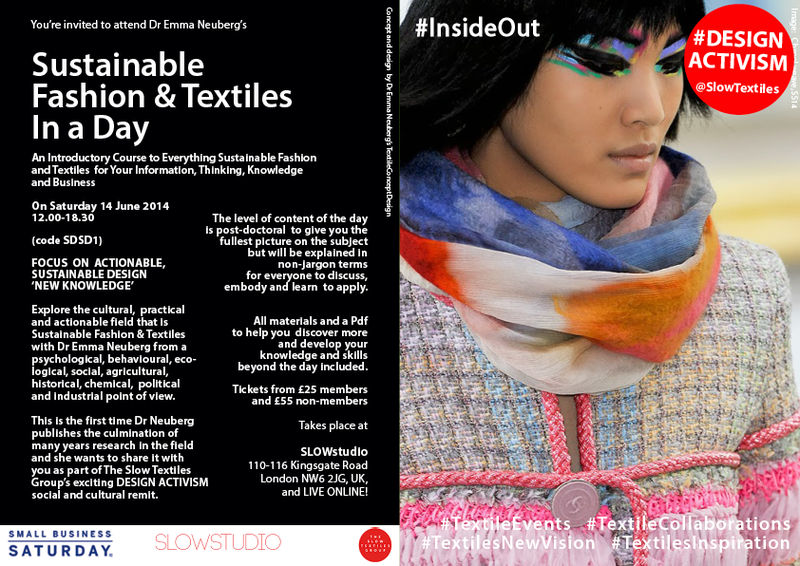 In support of UK Fashion Revolution Day (24th April 2014), Sustainable Fashion & Textiles In a Day attendees are invited to wear something #InsideOut ! Online Attendance Tickets are available for your convenience from just £25 (Slow Textiles Group Members’ Price). We use Google+ Hangout which is easy to use (all you need is a Google+ account). Alternatively, come to the London studio to gain the full experience of a professional textiles studio, personal tutoring, group experience and learning, Slow Textiles handouts and realia, embodied knowledge, networking, refreshments, a glass of wine and lots of fun from just £55! Previous articleUncategorizedWhat Colours Will Your Butterflies Be?